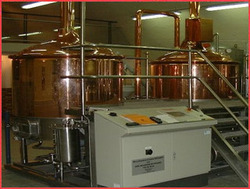 JAYA manufactures the cooling side equipments like tanks for fermentation, cooling and storage, whereas the entire high-tech machinery park, such as the brew house, its controls, heating system, malt mill and some other critical components will still be manufactured in Austria and combined with the locally manufactured items. We can supply breweries plant from 5 HL to 130000 HL. The plant can be supplied with semi automatic to full automatic plant. We are ready to offer you consultancy, supply of machineries, erection commissioning and training. Empowered with sophisticated infrastructure, We manufacture best quality brewery equipment. Being a quality centric company, we fabricate these equipment optimizing premium grade materials, which enhance their durability to a large extent. We offer these high performance equipment in a variety of sizes, shapes and finishes to choose from. We can also install these machines as per the requirements of our clients. We can also help our clients with importing various raw materials like specialty malts, hops, yeasts etc. 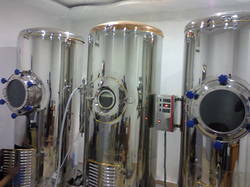 We are the manufacturer of Mini Brewery Equipments that constitute the part of brewery plant set-up. These are set-up in compliance with all the required standards and are appreciated for compact design and easy installation. 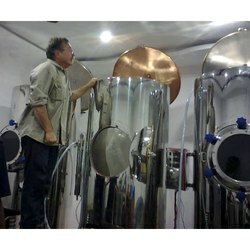 Looking for Brewery Equipments ?